Space Rogue Monster Invasion Update is Live! As the title says, new Space Rogue update is focused on giant space monsters – huge, dangerous and previously unseen enemies. Each monster type has unique abilities, which – we hope – add more variety and challenge to the gameplay. To defeat a monster, you should use your best tactical skills to hit monster’s organs in the right time and order. Manage your team members to avoid losses, be very careful and attentive. Monsters is a new gameplay mechanic for Space Rogue and the whole genre. But wait, there is more! We also add drones, small automatic combat vessels you could launch from your ship. Drones are stronger than regular ship weapons but much slower and less accurate. Also, drones need time to refocus their fire with each target change. For now, only two player ships are allowed to use drones – Monaro (Human) and Eri (Norg). By the way, Eri ship is a completely new playable ship specially designed for elusive combat tactic and drone usage. Superior is a stronger but rare version of each existing weapon. Specials are four unique wunderwaffles you’ll be eager to try out. Three new cartridges added in the game. Two of those focus on defensive gameplay by increasing crew’ repair speed or enabling crew’ personal shields. Another one – gives you the advantage in boarding actions by increasing crew’ attack speed (but reducing crew’ movement speed at the same time). NPC spaceships get very similar cartridges as well. 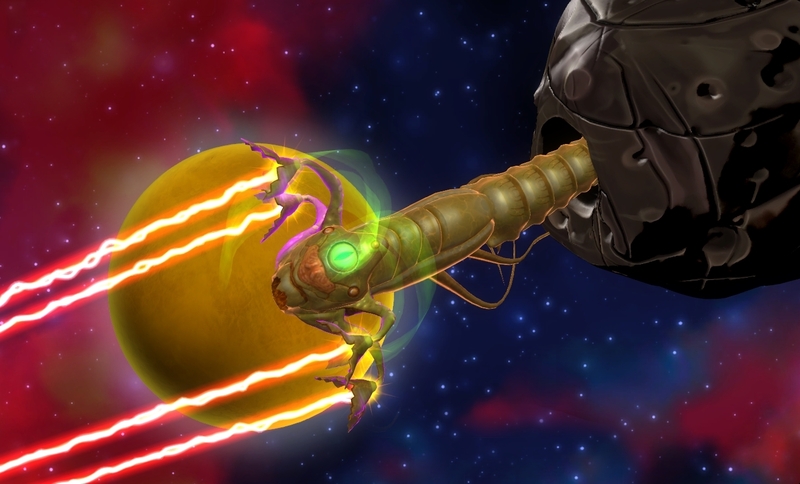 With Monster Invasion Update we also make a significant rebalance of cartridges’ energy cost. The goal of these changes is to make energy management more challenging. The new main mission will put face to face with a rogue general who plots against the Galactic Council. Also, we add several new events and sub-quests with space monsters. You can find more details on Monster Invasion Update here. We continue to update Space Rogue early access version with new features. From today players may choose between Human, Oaklana and Chax ships when starting a new game. Each ship is set up for a different play style, which you may try in two fully reworked main missions. Important notice: new ships will unlock by reaching certain profile levels. And that’s where our new progression system comes in! In Space Rogue a player will gain space points after every completed game and unlock new possibilities (as spaceships and story missions, for example). To gain points faster, a player could increase the difficulty using sandbox mode settings. For now a player can receive rewards up to profile level 7. New rewards will be added in further updates. There are sandbox presets (Easy, Medium, Hard) added for your convenience. They are balanced for the best experience of your preference. We’ve just released first big and important update for early access version of Space Rogue. Unfortunately, there is a possibility that the patch will corrupt current save game file. We have tried to avoid this as much as possible. However, new game features and massive gameplay fixes make transition process from old to new version quite challenging. We hope for your understanding. On the positive side, we’re introducing Plerx – hungry hideous space creatures a player may encounter now during events. There are two new unit types in the game: plerx crawler and plerx producer. We’re also adding Space News, temporary global events which affect the gameplay in various ways. Like, making beam weapons stronger due to strange energy anomaly or unexpectedly dropping repair prices. – Critical fixes for boarding mechanic! Player’s teleport is ready for use at the start of the battle. Player’s crew members no longer die when enemy’s crew is defeated. – Mining is more balanced now. Better reward/penalty ratio. No more unexpected hull damage! – Most of the annoying instant crew kills were replaced with the new type of penalty called “crew damage”. Your crew members have a chance to survive after receiving a damage if they have enough health points. – Added new modifications of combat cartridges for player’ ship and NPC’ ships. – New combat events added. Space battles should be more variative now (we tired of those pesky robots too!). – Two new big mordren ships added. Numerous gameplay, visual and UI fixes and tweaks are as well included in the update. You may check full patch note by following this link. Check out our game and vote for us on Steam Greenlight! The anthology of all four of the Master Chief’s Halo titles is released today on Xbox One platform. Red Beat is proud to be a participant, who helped to deliver this impressive remastered classic. You may check Polygon review for more details. First of all – hello, we’re glad you’re here. We’re new independent studio Red Beat, founded by ex-Nival developers. We’ve worked on Prime World: Defenders in a past, now we’re creating new shiny game about star adventures called Space Rogue. Space Rogue is a procedural and expandable space exploration game with that 1960s vibe. Shiny space ships, new frontiers, heroes and villains – you know the drill. We’re trying to combine crew management of FTL: Faster Than Light with space exploration of Space Rangers. So, if you’re interested in this kind of games, follow us on Twitter, like us on Facebook, or visit this blog now and then, we’ll keep you updated.